In his third season as starting signal caller at Penn State, Christian Hackenberg has endured a lot over the course of his collegiate career. His arrival to Happy Valley came at a time of uncertainty about the future of the Penn State football program, but two years later, it appears second-year head coach James Franklin is poised to lead the charge on the Nittany Lions rebuild, for better or worse. The offensive production under Franklin has been underwhelming, considering the playmakers on the Penn State roster. 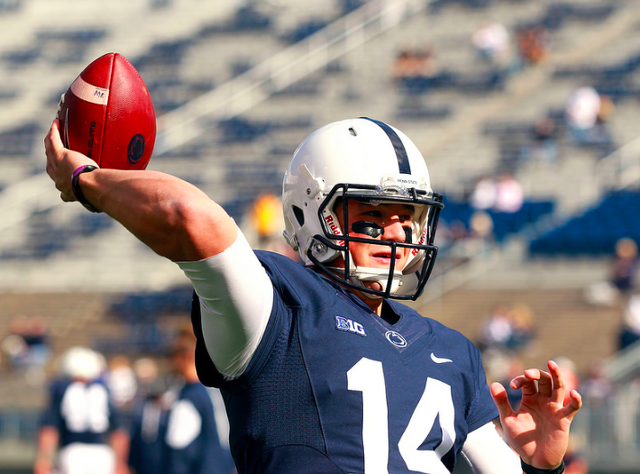 Hackenberg spoke via teleconference Wednesday morning on his ability to withstand the ups and downs that come with taking the helm of the offense. "On a personal level, that really doesn't matter, you know. What matters is what we're being asked to do and we need to be able to go out and execute on a high level. So that's how we all approach it, that's how I approach it and I know these coaches are game planning hard each and every week, we're game planning, we're working hard in the film room, working hard out on the practice field and we're just trying to win some ball games. So whatever's being asked of us, we deal with that 1,000 mph. If we make a mistake, we make a mistake and move on and try and get better." "Again, I think I can do what I need to do, throwing the football, whatever's being asked of me. I think mentally I'm sharp enough to pick something up, make sure we're in the right place, when we need to be there based on schemes and whatnot so at the end of the day the coaches mold that around what we have as a team and what works best for our football team. As a player I think one of my best strengths is being able to buy into that 100 percent and roll with it and we have a lot of guys that do that not just myself, so that's kind of what makes things work but I mean you guys (media) have obviously seen me play so I'm pretty sure you can write whatever you need to write off that." "I'm the oldest of four boys so patience has been one thing that my parents have preached on me since as long as I can remember, so I like to think I have a pretty big fuse when it comes to that type of stuff. I think each and every year we face challenges, it may be different at times but just being able to bounce back and kind of focus in and hone your focus in on the next week and the next opportunity and make sure you're better than you were the week before and then learning from that experience and just build on that. It helps build a lot of things, not just patience, but that's definitely one of the things that all the adversity, all the success kind of plays into all those different characteristics being built within a team, within a player, within coaches." "I think we've done a fair amount of things well. We've capitalized on making big plays down the field, throwing the football down. I thought we ran the ball well. From those things, we're going to continue to get better in all areas that go into it and keep working, keep looking at the film and keep trying to get better each and every week." "I'm going to keep playing for my teammates as long as I can play and until I'm either taken out or for whatever reason, so that's kind of my mindset behind it. So, for me, I wasn't really paying any attention to that. I was just worried about trying to execute plays and grind through with my boys." "I think there's always things you wish you can go back and do better and maybe hit this throw here or there but at the end of the day as a team we were able to get it done five out of the first six and we weren't able to get it done last week so I think that's what really matters to me the most, making sure as a unit, whatever my role in that, that we're winning football games so we're we just got to be back on track this week." "We've all been behind Adam. I've been through everything with that kid and he's one of my best friends. Just seeing him able to come back out and practice and start playing and getting into the flow of the game a little bit, that's really cool and I know that he's worked so hard to be able to to get to that point, both rehabbing and picking up the new offense. He had to do that basically by himself, so seeing him do that and work as hard as he can and to be able to contribute is awesome, and I look forward to what's to come with him. He asked questions, he did his thing, he got his playbook and he put in the extra time to get better and make sure he was up to par when he was ready to play, that's what I meant by that. He just worked extremely hard from that aspect, just as hard as he did rehabbing." "Mike's a great player, we all know that. Everyone goes through their adversity and struggle, however that may be, some bigger than others, but I know Mike's the type of dude that going to keep coming to work every day and keep getting through it. For me, the quarterback-tight end relationship, just keep throwing him the ball, he's going to make plays for you and it's one of those things where you just got to work through it and he'll get through it. He's got great teammates in the locker room, a great coaching staff and he's got a great attitude and approach." "When you watch Chris he's obviously playing with a lot of confidence right now. He's playing at a pretty high level, very fast, very crisp in his routes. He understands a lot of things going on so he's been able to, through his route running, through his techniques, through his fundamental, create separation and make some big plays down the field for us, which is what we're looking for and we're really excited about what he brings to the table and how much better he can still get. He's one of those guys that comes into work every day, put his head down and just tries to get better each and every day. Obviously, Chris was coming in as a freshman last year and DaeSean (Hamilton) and Geno (Lewis) were playing really well to start the seasons so that's kind of how our receiving corp works and that's very beneficial because each guy can pick up the slack for one another and you never key in on one dude. We have a lot of guys that can make a lot of plays for us so I think Chris knew what he had to do and he kept working and working and waited for his shot an when the opportunity came he took full advantage and I think from here the confidence blossomed throughout spring ball, in terms of workouts and then it carried over into this season and he's been able to do that and we've had guys compliment him. It's been really cool just seeing how that dynamic works and seeing each and every one of those guys make plays for us this year so far." Penn State planted its first American Elm trees in the late 1890s. As they grew, those trees became a staple of Penn State. They served as a quiet study spot, shade, and provided a majestic view for all students who passed by them.